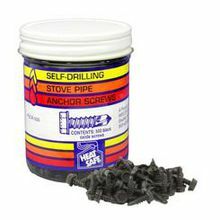 Heatsafe Stovepipe Anchor Screws. ALL single-wall vent pipe should be screwed together at each joint with a minimum of 3 screws. #8 x 18 x 1/2" self-drilling HEX head screws with a black oxide finish.